…there is so much space at the parking lot? Brakes not so good? Scared people bang backside? LOL!!! 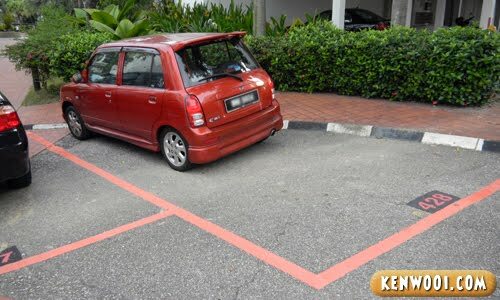 maybe leave a space for a kancil belonging to his fren? simple. the bugger just lazy to walk the extra steps to the sidewalk. 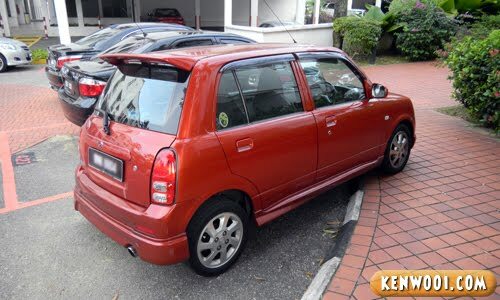 The owner has two kelisa so maximize the parking lot mah. Aisehman, to be in line with the rest, mah. Human nature is such, we like to belong. Is that your car, btw? Oops! Malaysians and their mentally can be changed sometimes. It is mild, you have not seen the worst. Haha. this is hilarious. I didn’t see the second picture coming! Cos the driver thinks his/her Kelisa very long! that’s one hell of a car! so that another kelisa can park there? hehehe.